Michigan Stadium is ready to play host to the 2014 Winter Classic. ANN ARBOR, Mich. (AP) — As the novelty of playing hockey outdoors seems to be wearing off, the NHL is hoping bigger is better at the Winter Classic. The league has been playing at least one game outdoors annually since 2008 other than last season because of the lockout. The popularity of the concept is being tested by putting six games in the elements this season. 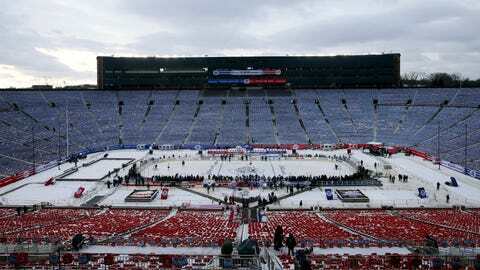 With a lot more fans and two Original Six teams, including one from Canada for the first time, the NHL is confident the 2014 Winter Classic will be different. "Those are two distinguishing factors," NHL Deputy Commissioner Bill Daly said. "It’ll be special." The league said 105,500 tickets have been sold for the game Wednesday between the Detroit Red Wings and Toronto Maple Leafs at Michigan Stadium. That almost doubles the average of 53,045 spectators who watched the first five Winter Classics. If every person who paid for a ticket braves temperatures in the teens on a snowy afternoon, a record will be broken. In the same football stadium, known as the Big House, Michigan and Michigan State set a hockey attendance record of 104,173 in 2010. "If you haven’t been to a football Saturday here, then you should put it on your bucket list," Red Wings coach Mike Babcock said Tuesday after a brief practice. "It’s the best sporting event. I’ve been to the Olympic Games, the World Series, the Stanley Cup. This is probably the best sporting event I’ve ever been to, bar none. "Can it transfer into hockey? I assume it can. Some players will borrow a practice from football, putting eye black on their cheeks to help cope with glare. "I remember back to Wrigley Field (in the 2009 Winter Classic), I thought it looked kind of silly when guys were doing it," Red Wings defenseman Niklas Kronwall said with black smudges under both eyes. "But it does actually help." And like some football games, shoveling might be necessary to clear the playing surface. Skaters with shovels cleared the ice before both teams practiced on Tuesday and they might be busier during the game. A winter weather advisory is calling for 4 to 6 inches to fall from Wednesday morning through Thursday morning in Ann Arbor. "A little bit of snow just adds to the romance of the game," NHL Chief Operating Officer John Collins said. A lot of snow, though, and 10 mph wind could become a problem for the Red Wings and Maple Leafs, who enter the game tied in the Eastern Conference standings with 45 points halfway through their seasons. "Cold you can deal with," Red Wings forward Justin Abdelkader said. "But if the snow is coming down hard and it’s windy, it can be pretty tough." If gusts are a significant factor, Toronto coach Randy Carlyle said the NHL will have the teams switch ends midway through the third period so that both play into the wind for an equal amount of time in the game. Snow hasn’t been much of a problem in previous Winter Classics because they’ve been played with an average temperature of 39 degrees on or around New Year’s Day. A blizzard, gale-force wind and below-freezing temperatures would not be enough to wipe the smile off the face of Maple Leafs captain Dion Phaneuf one day after he signed a $49 million, seven-year contract. "I got chills coming into the building," Phaneuf said. "You grow up playing on outdoor rinks as a kid. And to be able to come here and obviously with this news being announced, to have my family here it’s going to be a special game to be a part of. …. When there are 110,000 people, it’s going to be an experience I’ll never forget."